Pallet Rack Beams are available in three heights for differing load capacities and feature choice of step depths to accommodate either 5/8" particle board decks or 2" dimensional lumber decking. Beams are slotted in the step to accept the correct number of deck supports under decking. 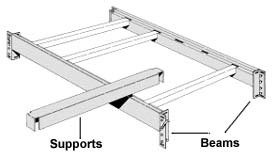 Deck Supports are formed heavy gauge steel with tabs which fit into beam slots, providing support for regular duty decking or to tie beams together to prevent rotation of beams where heavy duty decking is used.